How the heck do I install these properly? BEST ANSWER: Step 1: Thread strain relief boot onto end of ethernet cable jack will installed upon. Step 3: Take the 2nd small piece with individually allotted sections and group the wires into their proper slots, ensuring proper finger tension is applied to Step 2's piece, otherwise wires can potentially slide out of their holes. Step 5: Pinch the strain relief boot end and sheathed part of the cable between thumb and fore finger (prevents any movement of the wire's in Step 2's piece,), verify all 8 wires are clearly visible from the terminal end of the ethernet jack, and that all 8 wires are touching the plastic end of the terminal directly above the terminal contacts. Step 6: Insert into 8P8C crimper and crimp the terminal. Follow the directions in the other review. A good reference would be to order a premade SlimRun patch cable. I used it as a guide to make my first couple of cables. Looking at getting the 23 awg slimrun cable. 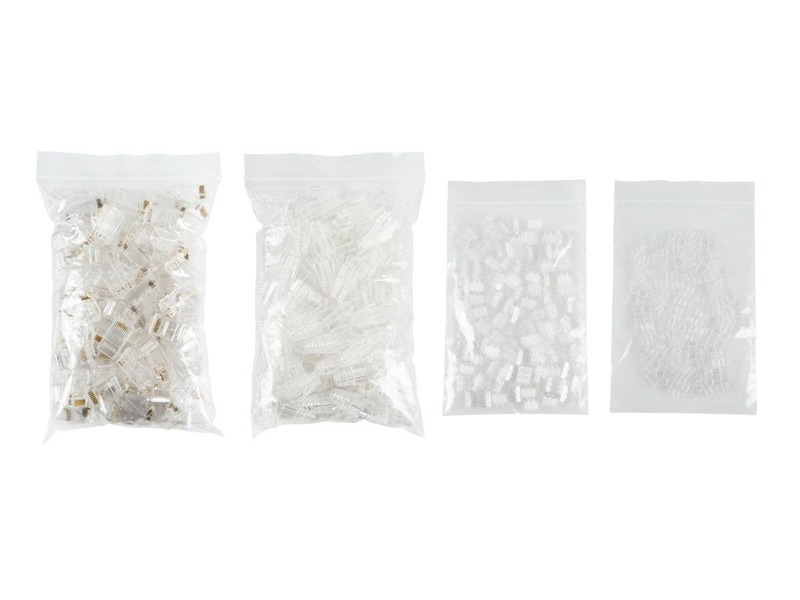 description says these are for 28 awg cable. concerned if they will work for the larger cable? BEST ANSWER: No they will not. We ordered these by accident and they fit no cable we own. Can Slimrun cables support PoE? Does the cable get hot? BEST ANSWER: I dont have the 1000' but I do use 3 to 20 pre made ones with POE cameras, No issues it's been almost 2 years since I started to use them. Cable is not hot and no drop in power. Do these connectors have pass through ends? BEST ANSWER: No, but with the instructions other reviewers have provided it's very easy to trim them the right length. Will these work if strain relief boot is omitted? have a clearance issue and these are not available in 90 degree configuration. needing feedback before purchase. Also what are the measurements specifically the length from end of connector to end ob boot? I had a few issues with compatibility, mainly stemming from my own ignorance. 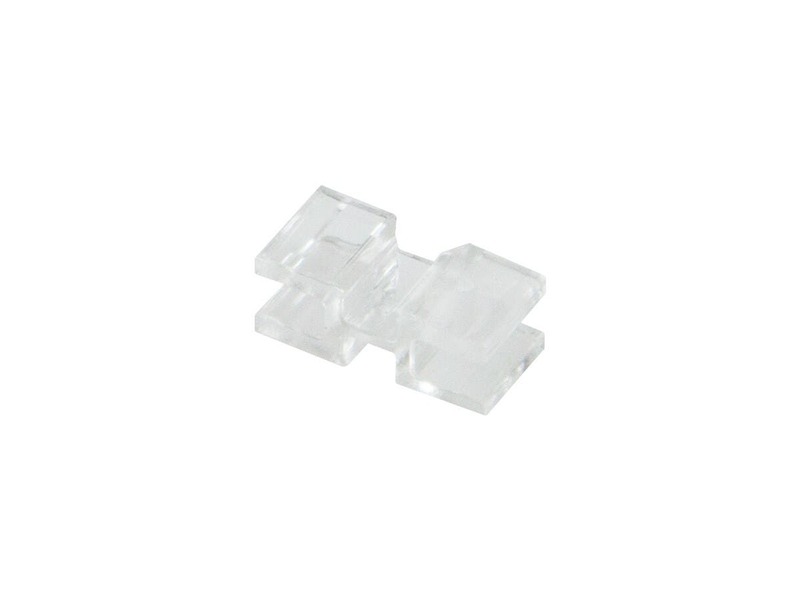 These connectors WILL NOT work with the CAT6A (30 awg) cables that Monorpice sells pre-made! I wasted about $300 purchasing the pre-made cables, only to find that only about 50% of them worked correctly. However, once I switched over to the 28 awg bulk 1000-ft cables that these were originally intended for, 100% of my crimps worked. One thing you should note while crimping is that 2 of the 8 holes in the wire alignment piece is slightly offset. When I went about trimming off the excess (using a Hakko CHP-170), the flat blades ended up pulling the ends of the 2 wires in the offset holes up towards the rest of the 6 wires. 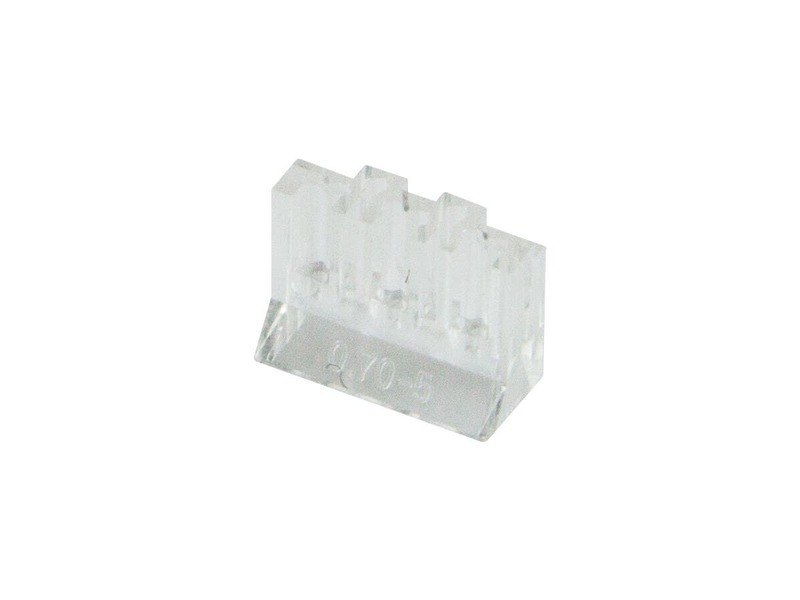 This caused a few issues when sliding the assembly into the RJ45 plug. An easy solution is after trimming the excess wire, take a small pin or other small object to gently push the two wires back into their intended position. 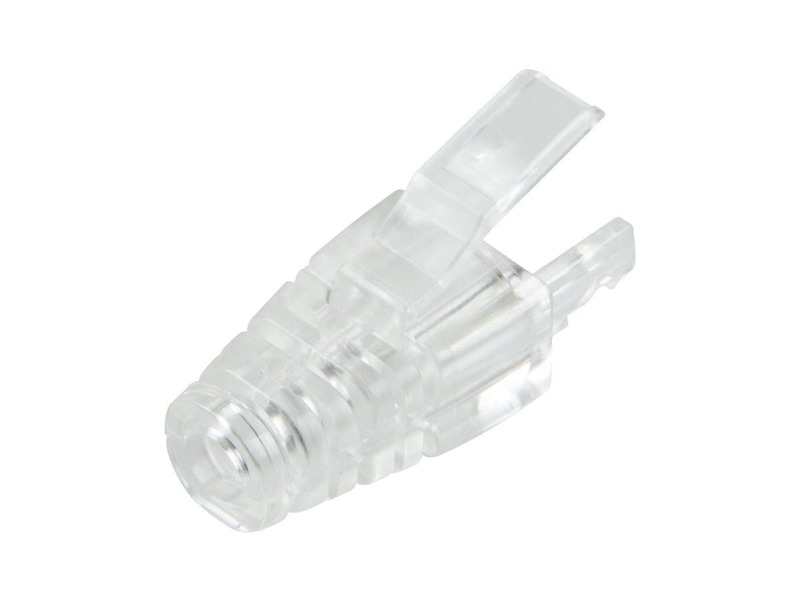 There should be no force required when pushing the cable/alignment assembly into the RJ45 connector -- it should fit in very loosely. The strain relief portion of this does not fit on a standard Cat6 cable - the cable is simply too big to fix into the relief boot. made it much easier. almost should be required. You can do it without but so much easier. I needed to make a few patch cables and wanted slim wiring due to a stuffed panel box. I didn't need 1000' of SlimRun cable and I wanted a bunch of different colour options. I purchased this with some premade slim run cables (20') of differing colours. I cut the ends off the premade cable, put these on a custom length (following the directions of the other reviewer) and voila! 2" patch cable! Couldn't be happier. Thanks Monoprice! 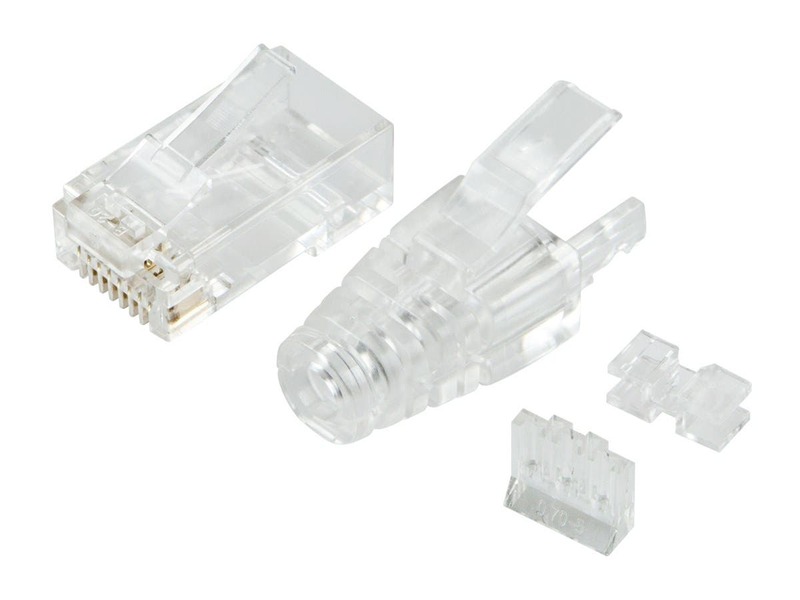 These are the exact same connectors as the pre-made Monoprice slim-run cat6 Ethernet cables, and are meant to be used with the bulk slim-run Monoprice sells (bulk cable is the same cable used in the pre-made ones as well). 1. Cut wire to desired length, + extra 6"
5. Untwist each pair, down to the top of the first insert (Use a machine bolt or screw as a comb to make untwisting easier. 6. Line up each wire side-by-side in correct order. (wO, O, wG, B, wB, G, wBr, Br) Straighten wires and space close together and evenly. 10. Slide inserts and wire into modular plug (it will be loose for now), release clip facing away, white orange on left. 11. Slide relief boot onto modular plug (you will need to squeeze the side tabs on the relief boot together a little bit), and make sure they're fully pushed together. Did not work on 26AWG cat6 cable. 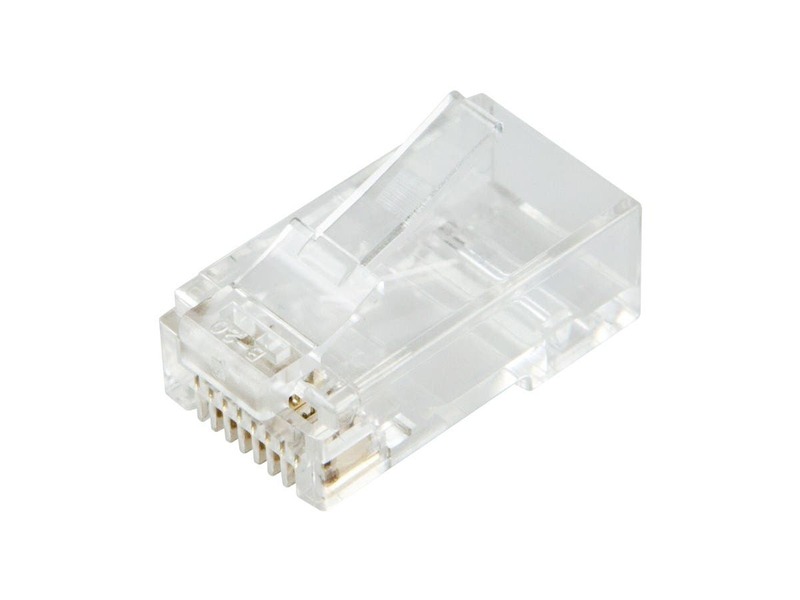 bought cat6 26AWG ccable from monoprice, and after runing wires during remodel when i tried to tip the wires i was having difficulty, contacted monoprice customer support they recommended this. I could not even get 1 connection right. I think this will only work with either 23 or 24 AWG and 28 AWG. the wires don't hold in place.